Tile Flooring Edgewood | Tile Floor Kent | Tile Installation Seattle - Seattle Flooring Co.
Tile flooring has been used around the world since its first introduction in Ancient Rome. Some award-winning characteristics of tile flooring include durability and a wide variety of colors and design options. Tiles can be made out of ceramic, glass, brick, cement, marble and many more types. Eco-friendly floor tiles made with up to 70 percent recycled content are now available as well. Considering tile floor installation? Choose already-made floor tiles from a local retailer or customize tiles into a unique mosaic pattern for an entryway. You can have your tile floors installed professionally or do-it-yourself. Many novice installers find tile floor installation to be less troublesome than other flooring materials, such as hardwood and bamboo. Aided with research and the right tools, you can find and install the perfect tile floors in your home in no time. When it comes to tile floor types, there are so many options and varieties to choose from. In many cases, you are only limited by your imagination. You can select small, large, or rectangular and hexagonal-shaped tiles for your flooring installation, or even mix and match different shapes to form an eye-catching tile mosaic. Mosaic tiles can be purchased individually or pre-mounted on installation sheets. Encaustic tiles: Available glazed or unglazed, encaustic tiles are inlaid with designs. Marble tiles: These tiles are very attractive and can be used in most household areas unlike polished marble, which can be very slippery. Ceramic tiles: Ceramic tiles are made by firing clay, talc, and other materials at very high temperatures in a kiln. Ceramic tiles come in both glazed and unglazed varieties and can be made with recycled materials (e.g. windshields or glass bottles). Porcelain tiles: Actually a type of ceramic, porcelain tiles are made by firing clay and other materials at a very high temperature. The result is a tile that’s dense and resistant to moisture. Porcelain tiles are ideal for bathrooms and kitchens. Glass tiles: Glass tiles come in a wide array of colors, shapes and sizes. They can be textured to increase their slip-resistance. Installation manuals for tile flooring have a way of making the process sound more difficult than it actually is. If you’re a novice installer, watching a professional install floor tiles can be extremely useful. Tasks like repairing the subfloor, putting down an underlayment and/or moisture barrier, and laying and sealing tile grout can all be better understood through a video. FindAnyFloor.com features an easy-to-follow tile floor installation video in their tile flooring section. This do-it-yourself video walks the viewer step by step through the installation process and is available in Windows Media, Flash Video and Quicktime. It is powered by Youtube. Place area rugs and mats in high traffic areas and entranceways and in water-susceptible areas (e.g. in front of bathtubs). Treat non-epoxy grout with silicone sealer twice every year to enhance the stain resistance of your tile floors. Damp mop tile floors with a cleaner recommended by the manufacturer. All tiles are different and require very specific types of cleaning products. Avoid cleaning products that contain ammonia or alkaline. Use a grout stain to return tile grout to its original color. Avoid using abrasive or steel wool on tile floors as it can damage the surface. Wipe up spills immediately with a clean cloth to avoid grout stains. Glazed tile floors need to be swept and/or vacuumed on a regular basis. 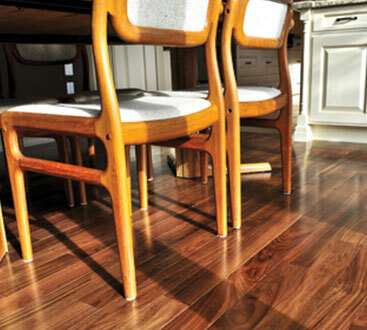 Put protective feet on the bottom of metal furniture legs as these can permanently stain tile floors. The decision to install tile flooring is not one that should be made on impulse. Things that factor into the floor purchase process include: current home décor; lifestyle factors; personal taste; and care and maintenance. How a floor tile rates according to the Porcelain Enamel Institute (PEI) may also be important, depending on where you plan on installing the tiles. The PEI classifies tiles based upon hardness and abrasion resistance (on a scale of 1-5) and recommends installation areas based on those results. Tiles are also classified by their water absorption potential by the American National Standards Institute (ANSI). Tiles are non-vitreous (most absorbent), semi-vitreous, vitreous or impervious (least absorption). Traffic – Higher traffic areas (e.g. living rooms; hallways) require a stronger tile floor. Consider harder tiles that have a PEI class rating of 5 such as porcelain tiles. Class 4 ceramic tiles are usually recommended for entranceways and kitchens. 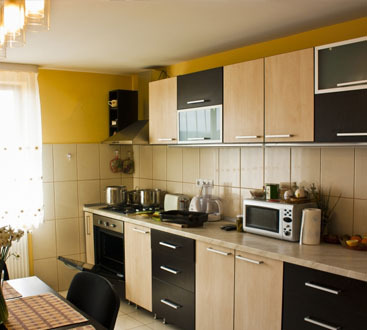 Room use – Some tiles can be very slippery when wet and may not be suitable for bathrooms. Reduce the risk of a slip by choosing textured floor tiles or unglazed tiles. Outdoor use – Temperature and humidity can play a big role in floor performance. Consider standard weather in your region when choosing tile flooring for outdoor use. Pets and children – Most tile floor types hold up well to wear and tear from children and pets. 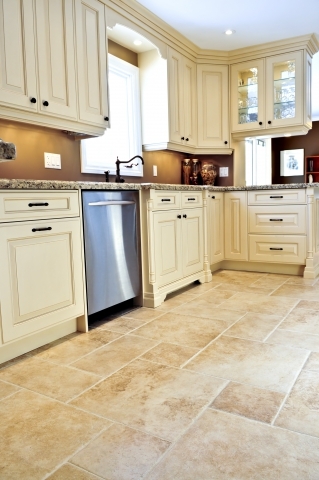 Help minimize damage from spills by choosing tiles that are of the impervious type. Special needs – The smooth and hard surface of tile floors can be ideal for wheelchairs and those with special needs. Interested in tile floor installation? 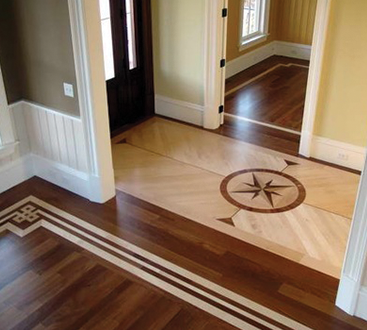 Contact Seattle Flooring Company for information about materials and pricing!